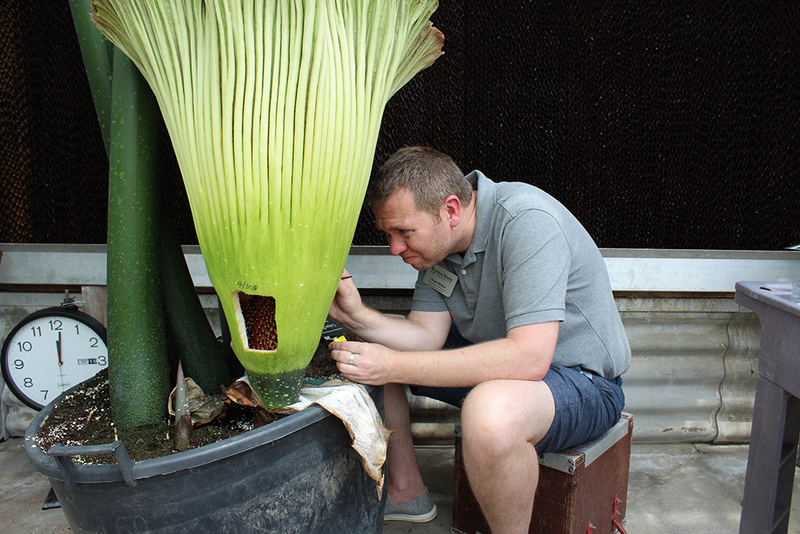 After cutting a window in the side of the spathe (the green outer “leaf” of the bloom), Chad Miller applied pollen, by hand. A highly-specialized piece of equipment was used to cut into the spathe: a serrated blade from a $5 Halloween pumpkin carving kit. MANHATTAN, Kan. — For the second consecutive year, a titan arum (better known as a corpse flower) has bloomed at Kansas State University. Last year’s bloom was the first for the tropical plant, a gift to the university back in 2001. 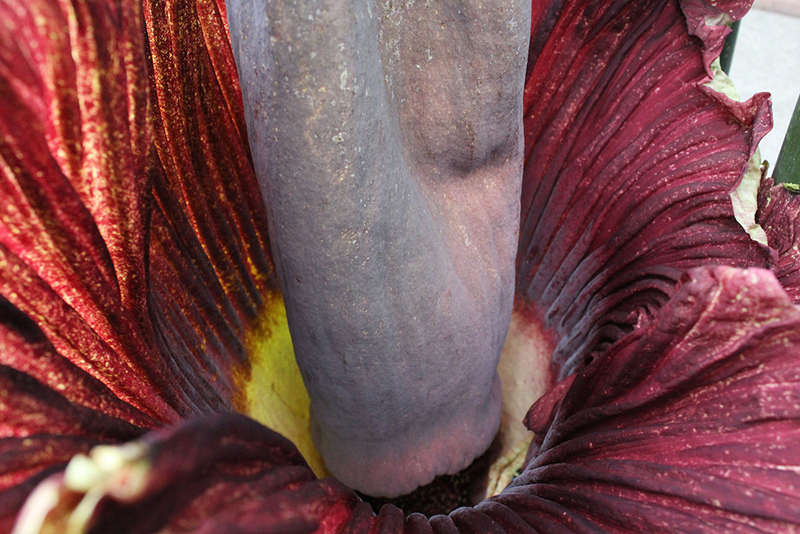 In its native southeast Asian habitat, titan arum can take more than 10 years to produce its first bloom. While Miller was caught by surprise in 2017, this year he knew what to look for. He said he noticed the developing inflorescence about three weeks ago. “Because we were finishing the semester, I had two finals to give and projects to grade, so I had to make sure all that was done first,” he said. 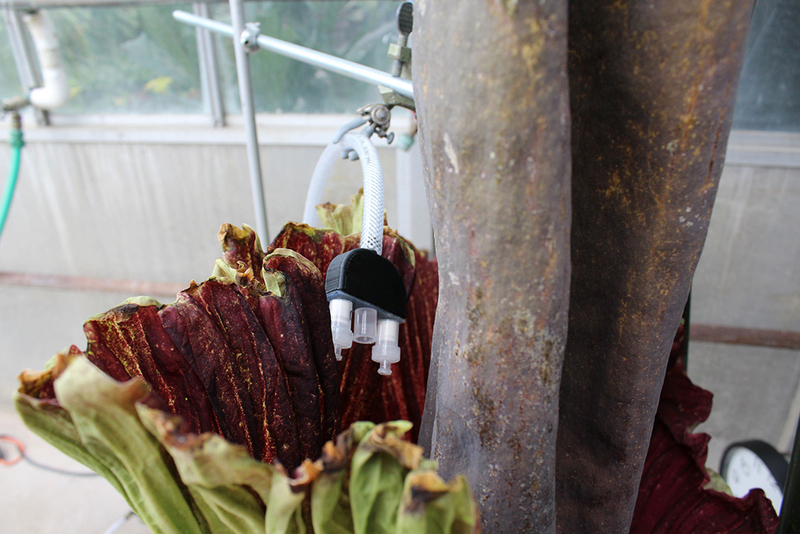 While the titan arum is a rare plant, native only to Sumatra and Java, modern greenhouse technology has allowed it to be cultivated around the globe. A list of just some of the other places it can be found in the United States includes California, Arizona, North Carolina, New York and Illinois. 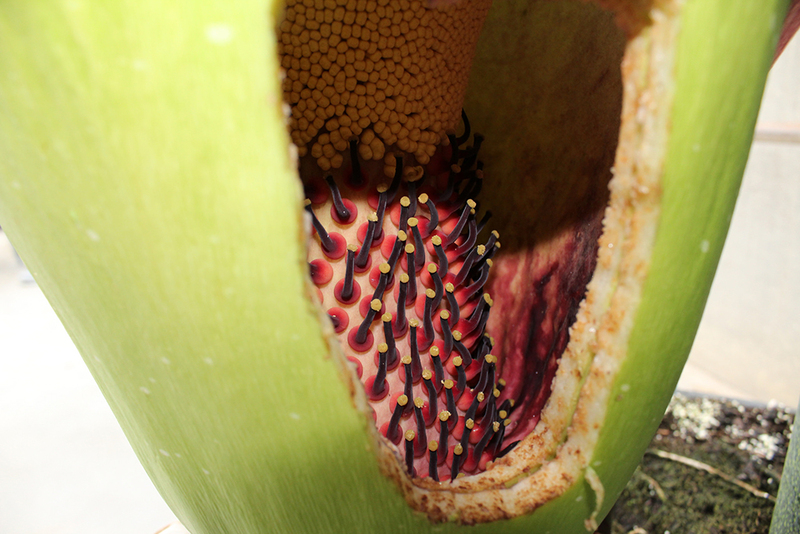 In its native habitat, the titan arum is pollinated by flies and carrion beetles that are attracted to the plant by its strong (even overpowering) stench. In greenhouses and botanical gardens, the plant is pollinated by overnight delivery. “The folks at the Chicago Botanic Garden were very gracious to share some pollen, several vials of pollen that had been harvested at different times and stages of the blooming process of their recent inflorescence,” Miller said. 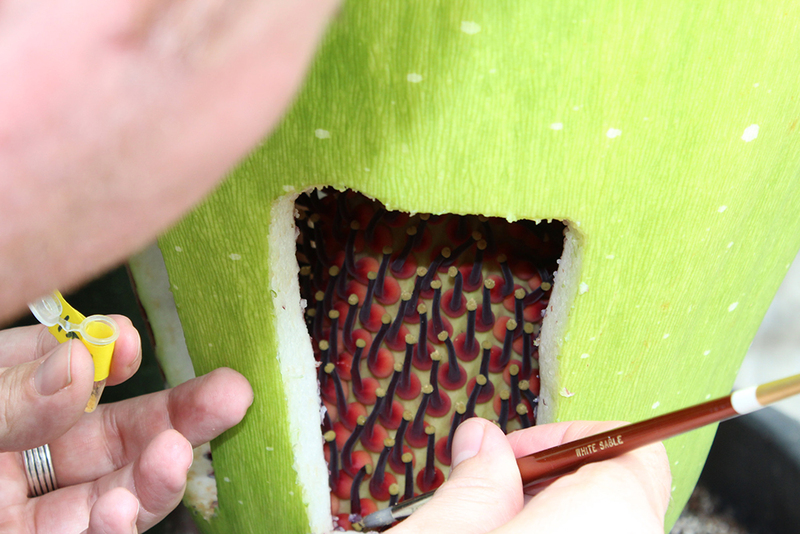 Using a small paintbrush, Miller carefully applied the donated pollen to the lower part or female florets of the K-State bloom. If there was successful fertilization, he should be able to harvest seed in about 6 months. “I also harvested pollen from our plant. If we can set up a long-term storage solution, I can save the pollen and then certainly share it with Chicago, and other gardens and institutions when they have a flowering event or two, that they might want to do the cross pollination,” he said. The educational displays, the live feed, talking with visitors – it all makes for a very non-typical day at the office, or greenhouse. “I’ve told visitors this is really – for lack of better words – it’s a ‘side show’ to what I normally do. I’m still learning about this plant, as everybody else is,” Miller said. 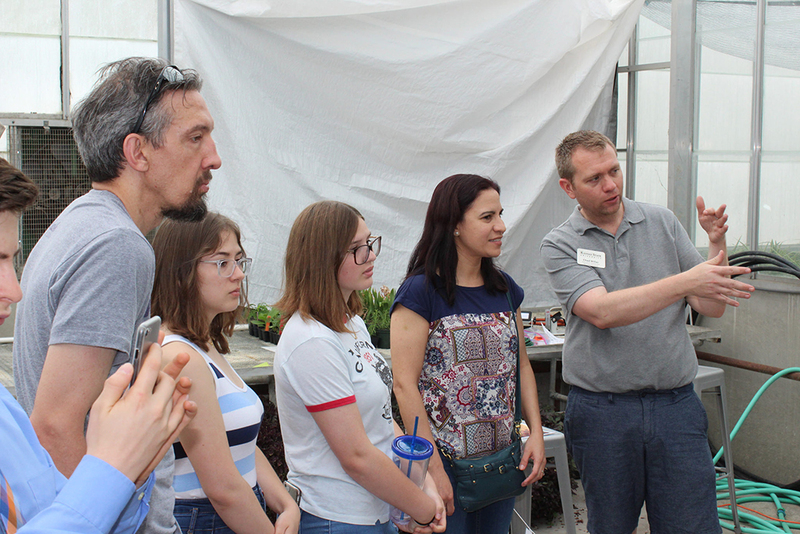 Chad Miller (right), discusses the titan arum or “corpse flower” bloom at Kansas State University on Saturday, May 19, 2018. Sampling the gases emitted by the bloom. Chemical compounds will be analyzed. Using the paintbrush, bits of pollen are dabbed onto each of the female flowers. With any luck, the flowers will grow small round “fruit.” The pollen will be harvested, put into long-term storage, and shared with other universities and gardens. Looking down inside the bloom. The peduncle is inside the spathe. “Male” pollen is towards the top, the cluster of yellow. The “female” flowers are below.